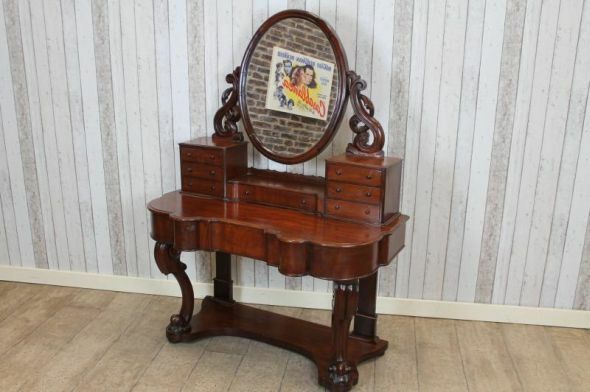 An elegant and small late Victorian mahogany duchess dressing table. It features an oval mirror supported by decoratively carved side arms. To the base of these arms are small jewellery drawers, and a small central drawer for make-up etc. The item is in good condition for its age, but it does have signs of wear and tear to the polish work and the odd blemish to the veneer and timber work. This is to be expected from a piece of this age which has been used daily. We believe that it dates from the late Victorian period; circa 1890. A lovely piece of late Victorian bedroom furniture; ideal for any period bedroom interior.